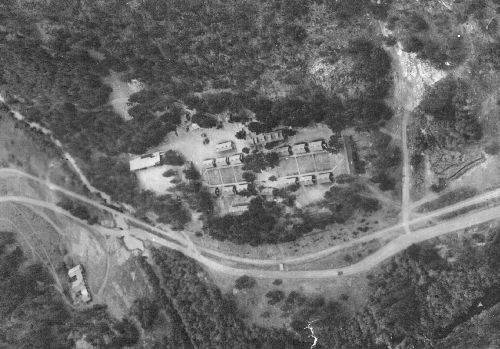 Camp F-4, Pactola, was located in Bear Gulch of Rapid Canyon, 2 miles west of the village of Pactola (1934). The camp and village were both inundated by Lake Pactola during the early 1950s. 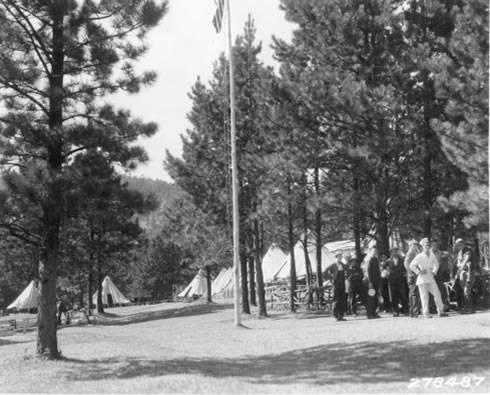 Established June 8, 1933, the camp was closed between January 1940 and July1942. The 20 original buildings included ten 20-man barracks, officers' quarters, mess hall, hospital, headquarters, supply and PX, bath house and light plant, laundry, garage, foreman's quarters, and forestry office, all on the banks of sparkling Rapid Creek(1934). Companies 1789--6/8/33-10/35 and 2748--5/25/36-1940 or later occupied the camp. The men of Company 1789 arrived in Sturgis on the fine sunny morning of May 25, 1933. The time was the birth of The New Deal, terminating a long period of unemployment, and bringing them into new jobs in pleasant surroundings. But on that particular morning, they wondered just what was in store for them (1934). Fort Meade Conditioning Camp with "Bird Cages" in foreground (Courtesy of USFS). They were met by a fleet of reclaimed mail trucks of the Commerce model, later designated as bird cages, in which they bumped over the 3 miles to Fort Meade. They were an odd sight to t he officers, for each man was dressed according to his individual taste which varied from ragged overalls and jackets to good suits and clothes remaining from better days. Immediately they were put through the ordeal of processing, a good bout with soap and water, and then a physical examination. This took most of the afternoon. They were judged as fit for duty the next morning (1934). Fifteen days of conditioning followed when they dug various ditches and labored at the army riding hall, then in the process of construction. Clothing was issued about a week after their arrival at Fort Meade. By this time they were a fully fledged company (1934). Lt. Trapnell, the second in command, loaded 30 men into the ever-present bird cages on June 8 and set out for Bear Gulch. On the south side of the gulch on a semi-level area they laid out the camp site and put up cook tents, preparatory to the arrival of the remaining men. The following day the commanding officer and the rest of the men arrived by train. Among high weeds and brush the tents were set up in approved military style. 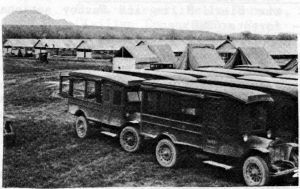 About a week was taken to make the camp livable, the men hacking out brush and weeds and trimming the trees or chopping them down when they were in the way of orderly erection of tents. A road was built into the camp and the men were ready for more serious work in the forest. On June 10, 56 experienced woodsmen who had been recruited at Spearfish arrived, bringing the company strength to 208 men (1934). When time came for winter construction and the size and type of buildings needed to house 200 men had been determined, it was decided that they should be placed in approximately the same places as the tents. A small sawmill was rented from Mr. Provine of Hill City, brought to camp, and set up. 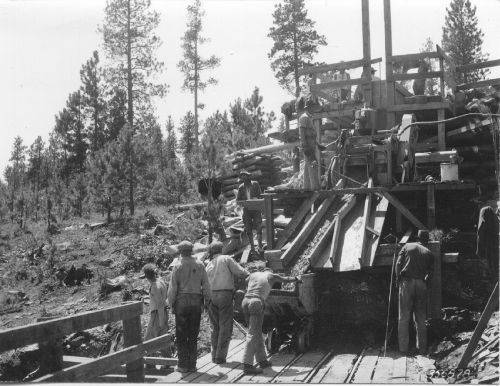 Trees were cut into logs, and a crew sawed them into boards to be used in camp buildings. Thus all but the finished lumber used in the floors was secured from the timber about camp. Civilian carpenters, varying in number from 8 to 12, and augmented by CCs, raised the buildings. In about 6 weeks most were constructed and occupied (1934). Company 2748 was formed July 19. 1934, at Camp Haselrodt, left July 30 for Camp Tom Berry, moved to Camp Tigerville October 20, 1934, and was transferred to Camp Pactola May 25 1936, where it remained active until sometime between January 1940 and July 1942. The Meade American, camp paper from Camp Fechner, reported in June 1939 that the Camp Pactola baseball team had Played Fechner, and in January 1940 reported that Company 2748 had participated in an inter-camp contest. The Islander camp paper from American Island reported that Camp Pactola had a basketball team in the state tourney in March 1941.
xDerschied, Lyle A. 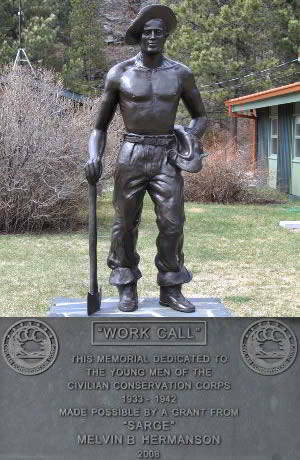 "The Civilian Conservation Corps in South Dakota, 1933-1942." Brookings, SD, South Dakota State University Foundation Press, 1986. No longer in print. Available at some libraries but may not be checked-out.